The DGT (David Grissom Trem) is the result of more than 20 years of collaboration between Paul Smith and David Grissom. The DGT is based on the McCarty with a unique DGT neck shape, taller frets, special pickups, and a revised control layout. Grissom and Paul spent a year A/B-ing more than forty sets of pickups before nailing the vintage-voice of DGT humbuckers. When paired with individual volume controls for each pickup and a push/pull master tone control that operates the coil taps, DGT pickups provide versatility and articulation. This 509 should have left PRS as a Wood Library Special Run model but somehow did not. It has a spectacular flamed maple 10-top finished in a rare custom color - Charcoal Purple Burst, with a combination gold and nickel hardware. To top it off, this guitar has an Ebony fingerboard, Ebony headstock overlay, and Pau Shell Artist Grade original style Birds inlays. All these are options normally only available on a Wood Library guitar. Originally a color from the original run of PRS Modern Eagle guitars, this Wood Library 594 run is finished in Satin Charcoal Nitro, with a figured mahogany neck. To top it off, the model has a bound Brazilian Rosewood fingerboard, Green Ripple Abalone original style Birds inlays, and comes with a PRS Black Paisley Wood Library Hard Case. The McCarty 594 is a vintage-inspired instrument that is at once incredibly familiar and effortlessly playable. Whether you are looking for rich, authentic, vintage humbucking tones or nuanced, sweet singlecoil sounds, the McCarty 594 can seamlessly master both sonic territories thanks to the 58/15 LT pickups and push/pull coil taps on the tone controls. The electronics layout, a few key specifications, and PRS craftsmanship combine in the McCarty 594 to create an instrument that plays in tune, is intonated the entire length of the neck, and feels like a guitar that you’ve been playing forever. 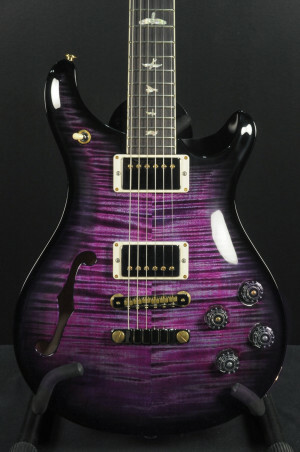 Here's a beautiful Semi-Hollow McCarty 594 in a rare finish, Violet Smokeburst Wrap. It features a highly figured flamed maple 10 top, 58/15 LT (Low Turn) pickups to deliver vintage hum bucking and single coil tones, push/pull coil taps on the tone controls, and updated Phase III locking tuners that transfer more energy to the headstock.The guitar's f-hole and semi-hollow body give the instrument a breathy tone and rich resonance. The electronics layout, a few key specifications, and PRS craftsmanship combine in the McCarty 594 to create an instrument that plays in tune, is intonated the entire length of the neck, and feels like a guitar that you’ve been playing forever. The McCarty 594 Semi-Hollow had its debut at Experience PRS 2018. The McCarty 594 is a vintage-inspired instrument that is at once incredibly familiar and effortlessly playable. Whether you are looking for rich, authentic, vintage humbucking tones or nuanced, sweet single-coil sounds, the McCarty 594 can seamlessly master both sonic territories thanks to the 58/15 LT pickups and push/pull coil taps on the tone controls. The electronics layout, a few key specifications, and PRS craftsmanship combine in the McCarty 594 to create an instrument that plays in tune, is intonated the entire length of the neck, and feels like a guitar that you’ve been playing forever. The S2 Studio takes the Standard 22 platform into new sonic territory with a single/single/hum pickup configuration and updated switching system. This versatile setup allows for a whole new scope of sounds that are only possible with a three pickup guitar, whether you’re looking for punchy singlecoils, vintage scooped tones, or the chunky kick of a bridge humbucker (that can still be split to singlecoils via the push/pull tone knob for a three single coil set up). With eight combinations in all, the S2 Studio covers classic tones but maintains a unique voice making it a perfect “desert island” guitar. Featuring an amazing one-piece figured maple top, and a Faded Whale Blue Smokewrap Burst finish. PRS Guitars is proud to offer the acclaimed McCarty 594 and McCarty Singlecut 594 with PRS/Seymour Duncan Soapbar pickups. McCarty 594 models were designed to rival the best vintage instruments, meticulously spec’d with a 24.594” scale length, Pattern Vintage neck carve, tweaked Phase III locking tuners with modified collars and set screws, and a two-piece zinc bridge. Soapbars are one of the most classic pickup designs and add another tonal option for players that is at once incredibly familiar and effortlessly playable. For this PRS/Seymour Duncan collaboration, we started with the Seymour Duncan Antiquity P90 for its sweet, vintage growl and cool, gritty sparkle. However, we modified the pickup slightly so it sits at the proper height in our cavity design. Like with original Antiquity pickups, chords sound full and round, while single notes sing sweetly. A relatively low output pickup, these soapbars have a many usable voicings by simply adjusting your volume and tone controls. This McCarty 594 feataures a McCarty Sunburst finish, and a Brazilian Rosewood fingerboard and headstock veneer. This McCarty 594 feataures a 10-Top, Yellow Tiger finish, and a Brazilian Rosewood fingerboard and headstock veneer. This McCarty 594 features Brazilian rosewood fingerboard. This feature is usually only available on Artist Package models, but is available here for a very limited time. This McCarty 594 features Brazilian rosewood fingerboard and a Purple Mist finish. These features are usually only available on Artist Package models, but are being made a available for a very limited time.